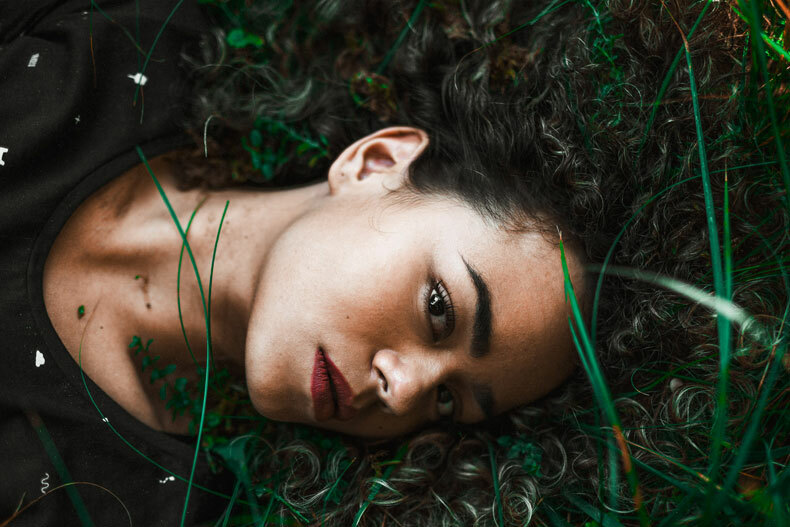 Fast fashion – that is what we call this trend, which is nice for us consumers, as we can dress ourselves quickly and cheaply according to the latest trends, without having to look behind the scenes. But when the textile factory Rana Plaza, collapsed on April 24th in Bangladesh, 5 years ago and 1138 people were killed and 2438 were injured, questions arose such as: Who actually makes my clothes? How is it possible that a T-shirt, for which cotton is grown, that has to be woven and dyed, that has to be designed, cut to size, sewn, and then has to be delivered to its destination a long way away, only costs 3 euros in our stores? In memory of the Rana Plaza disaster, Fashion Revolution Week will take place from 23.4 – 29.4., for the fourth time. The aim is not the focus on fashion trends, but the heritage and production of textiles. With workshops, flash mobs and events but above all with a large-scale campaign on social media under the hashtags #whomadeyourclothes or #imadeyourclothes the awareness for one of the on going”dirtiest” industries, should be heightened. This year, I would also like to contribute to this great event with a blog tour. Every day on our Fashion Revolution Week blog tour, I will introduce people, companies and labels who are committed to fair working conditions, ecological guidelines and sustainability, in their work. To tune in, so to speak, as a “kick-off” of the blog tour, I would like to present today a company from the Netherlands, that produces under the label “Kuyichi – Pure Goods” transparent, fair and environmentally conscious jeans, sweatshirts – and T-shirts. If you go to their website you can learn everything that we should actually be interested in, when buying a garment: click on “Pure Production” and you will get all information about the supply chain of Kuyichi. “Pure Denim” describes which fibers, the fabrics are made of and how they are dyed. And go to “Pure Stories” and you will get insights behind the scenes of Kuyichi and their numerous cooperations. As part of a recent collaboration with the Dutch NGO Justdiggit and the designer and artist Antoine Peters, two T-shirts have been created from which all profits will go to the landscape restoration projects of Justdiggit. Justdiggit successfully develops large scale landscape revegetation projects, with a positive climate impact in Africa. They make use of different types of techniques for collecting rainwater so that it can penetrate the earth again and give vegetation a chance to recover. This process stimulates plant growth, restores the water cycle and puts nature back in balance. More green vegetation means more oxygen, less CO2 and a cooler planet for all of us. According to their slogan “if we can warm up the earth, we can also cool it down” they believe that vegetation is the air conditioning of the planet and by making dry land, green again by capturing rainwater using different techniques and introducing sustainable agriculture to you can create healthy ecosystems. The Floor T-shirt from Kuyichi was designed by the Dutch artist and designer Antoine Peters as a “conversation starter”. So the design may initially seem rather pleasing, on closer inspection though, the symbols are readable: they show the different steps of the Justdiggit revegetation projects. 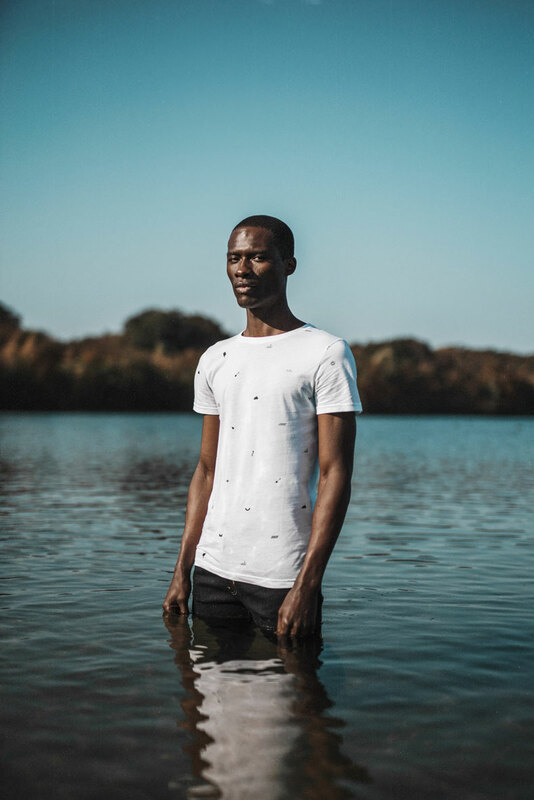 With their Fashion statement T-Shirts, Kuyichi wants to raise awareness about the threats of global warming and show that the power to change is in our own hands. 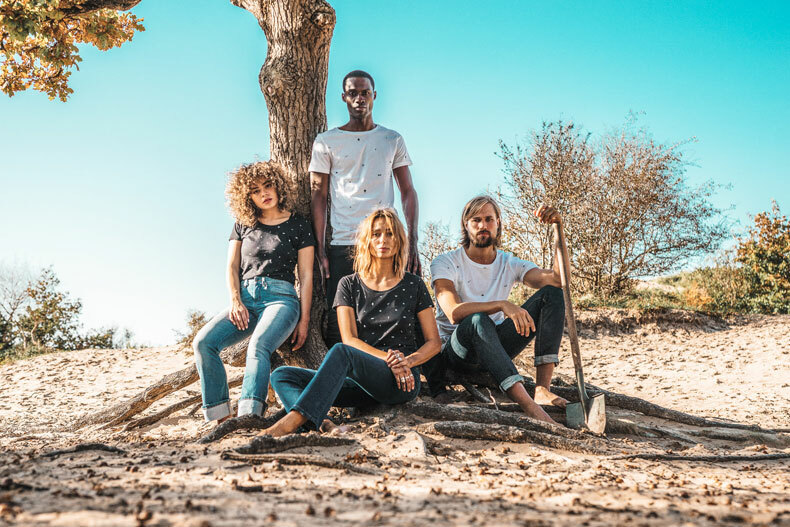 To promote the Shirts they launched a great campaign together with influencers, designers and activists such as Jordy Casteleijn, Merrel Westhof, Sauka Pedro Ali, Celeste van Joost and Elke Salverda. Beautiful pictures emerged, showing the different stages of the landscape restoration projects of Justdiggit: you start with the soil and bring water back so it can lead to vegetation again. I think this is a wonderful and quite complex cooperation and I am very happy that I have one of the Floor Shirts from Kuyichi Pure Goods to give to you in a give away. Please leave a comment below until tonight 12pm CET. The winner will be announced tomorrow in the next post for the blog tour. Besides labels such as Kuyichi and many others, which I would like to introduce you to over the next week, sewing and making your own clothes is, of course, no less sustainable. For this reason I‘m releasing a new free pattern for you. Maybe one or the other of you, will be able to sew the Margo skirt this week and then show it off, using the hashtags #imademyclothes @schnittchenpatterns. I hope you‘ll enjoy our Fashion Revolution Week Blog Tour and I look forward to reading your comments and hearing your view! Really excellent way of combining two good causes.